Article first published as TV Review: Dexter Comes Back Strong on Blogcritics. 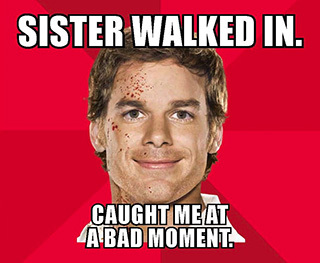 This Sunday night was the much awaited season premiere of the hit show Dexter and it did not disappoint. Sunday night is full of popular shows but Showtime’s award-winning shows can hold their own against the competition. If you’re not sure about it then check out the encore presentations after the initial airing. We pick up where we left off last season, with Debra walking in on Dexter fatally stabbing the serial killer Travis Marshall. Dexter tells her he snapped and it was self-defense. Debra agrees not to report it since he’s her brother and he convinces her he would lose his son. She wants to believe him and allows him to torch the scene but doesn’t understand why Travis was wrapped in plastic similar to the style of the Ice Truck killer. Dexter doesn’t attempt to give too much explanation and hopes that Deb will forget the whole thing and things can go back to how they were. Though Deb has always had a blind faith in him, this is too much to ask. However, Deb’s detective instincts won’t let her forget, and she eventually finds Dexter’s blood slides and knives. Now, Dexter admits that he’s a serial killer and we have no idea how this new honesty will work out for them. Obviously this means things can’t go back; what will this mean to Deb/Dexter’s relationship? For years, Deb has been trying to get closer to Dexter while he has been hiding his other side. Though they are adoptive siblings, Deb was discovering in therapy that she may be in love with him. Debra has always meant a lot to Dexter as well and therein lies the conundrum. Will she be able to accept the real Dexter or will he attempt to change for her. Will he get caught by someone else since La Guerta found the blood slide he dropped when killing Travis? Seems like this season will be pretty intense and better than the last one. The show is on its final run of 24 episodes. This means they could take things in any direction, but whichever way they go I’m sure it will be a fun ride. Pretty impressive that they’ve gotten us to root for a serial killer for seven seasons already! This entry was posted in Entertainment, Television and tagged Blogcritics, Dexter, Dexter Morgan, Michael C.Hall, Serial killer, Showtime, Television. Bookmark the permalink.